Come join us for an unforgettable Patagonian sea kayak adventure in the magnificent fjords of Comau, Quintupeu and Cahuelmo, the eastern side of the Gulf of Ancud, where wild mountains cliffs soar out of the dark waters to touch the sky. This 8-day Sea Kayaking trip is an unforgettable adventure where you will experience amazing glacial valleys, spectacular volcanoes, emerald lakes, temperate rainforests, stunning mountains and an abundance of marine wildlife including dolphins, sea lions, penguins and other sea birds. Quite simply this is the quintessential ‘bucket list’ adventure that you must check off! Patagonia has become synonymous with adventure and for good reason, it has a unique beauty that speaks to one’s adventurous spirit. Transfer in from Puerto Montt airport to hotel in Puerto Varas. Free time to relax in this picturesque city of the Lake Region with its century-old mansions, cozy restaurants and natural attractions along the shores of Llanquihue Lake. Welcome dinner and overnight in Puerto Varas. We reach the Petrohue river falls and to continue on to Todos Los Santos Lake also called the Emerald Lake. After lunch we drive up the Osorno Volcano. 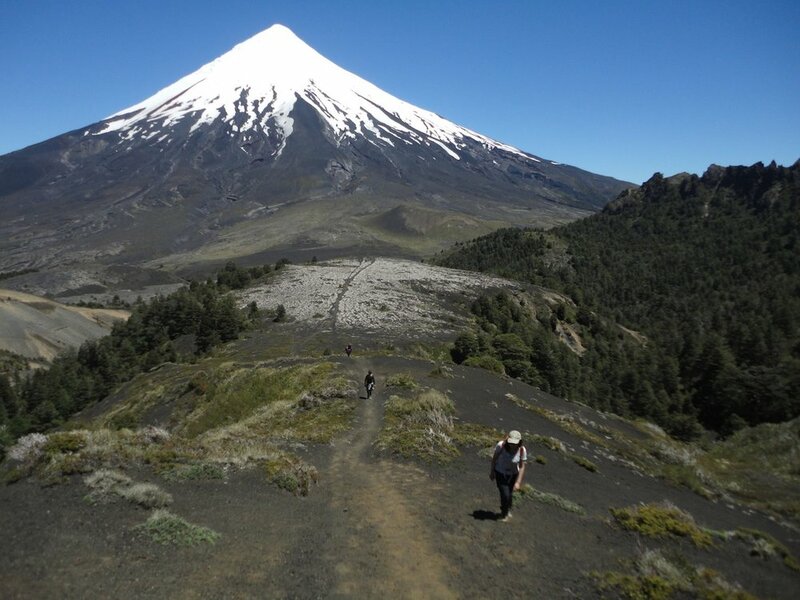 At 3000 feet, we reach la Burbuja Crater, where an amazing view of the valley awaits including The Calbuco Volcano, the Tronador Mountain and the winding path of the rivers. After breakfast in the hotel we drive down the Southern Highway and cross the Reloncavi Estuary to Hornopiren. We board our support vessel and head for Los Ciervos Island for lunch in a nice cove. After lunch we sail on to Llancahue Island, where we climb into our sea kayaks for instruction and practice. Camp for the night on Llancahue island. We put in near the entrance to Quintupeu Fjord, where the German battleship Dresden hid out during World War I. The sheer slopes, cut by countless waterfalls tumbling off the heights, are covered with lush vegetation that hangs over our heads. As we glide along under this lush canopy, we try to catch a glimpse of dolphins jumping near our kayaks. We camp at the end of the fjord. We paddle down to Cahuelmo Fjord, stopping at the entrance to see if there are any sea lions at play. We don't stop for long though, because we continue paddling to the far end of Cahuelmo in time to get up the river, or hike through the wild tidal flats. Finally, we take a relaxing dip in Cahuelmo Hot Springs before turning in for the night. Our goal for today's journey is Porcelana Hot Springs. Stop at the settlement of Huinay and hike up a glacial valley surrounded by snowcapped mountains. From this village we cut straight across Comau Fjord to Porcelana, where we pitch camp in a lush green pasture. We paddle down to the end of Comau Fjord to Leptepu, passing by stunning snow-capped peaks on our way to a secluded corner with plunging waterfalls and virgin forests. We also see a lagoon, teeming with wildlife which we can reach by kayak at high tide. 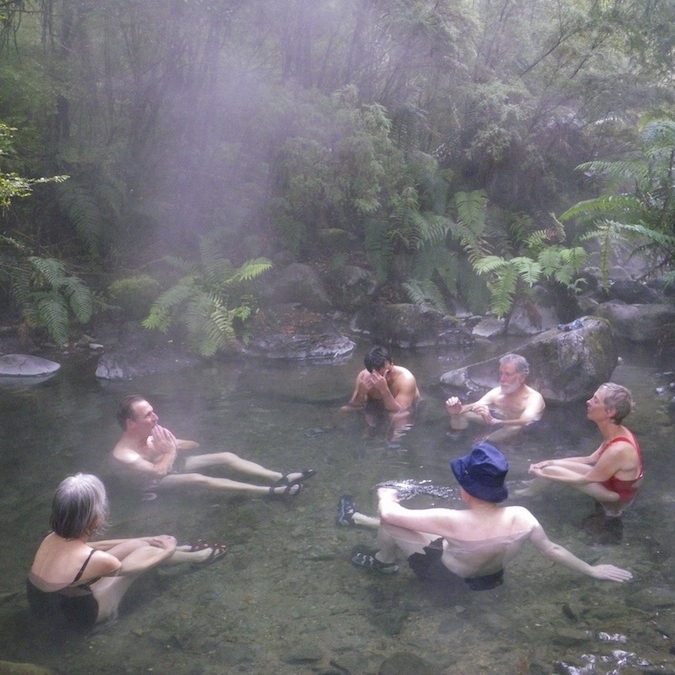 In the afternoon we return to Porcelana and head for the hot tidal pools surrounded by magnificent scenery. We take the road back to Puerto Varas (or Puerto Montt) in time to catch the evening flight or bus to Santiago. March 1-8 - Filling fast! March 17-24 - 4 spaces left! 2-person, fiberglass sea kayaks with rudders, waterproof bulkheads, hatches, etc. *This trip requires some prior experience with kayaks. We may encounter variable weather, sea-state and tidal conditions that may require modifications to the itinerary. You should be comfortable in water and be in reasonably good physical condition. After that, a love for the outdoors and desire to see one of the most beautiful places on the planet is a must. *Chile can be a challenge. Often things don’t go as planned. Flexible travelers with a sense of humor consider it part of their Chilean adventure. Our Chilean partners work super hard to make your tour unfold seamlessly, but sometimes itinerary changes happen in light of hardships in Chile.